I’m ready for a new retail shopping experience, how about you? Last holiday season the hubbub of the mall helped get me into the spirit, the checkout lines moved more quickly than I expected, and I thought the retail workers were surprisingly resilient. But I still value the overwhelming choices offered by online shopping, the ease of clicking and shipping, and the recommendations and reviews that are part of the online shopping experience are hard to overlook. “Thank you, Sam. I am looking for a pair of headphones,” I reply. “Then just follow the green dots on the floor on your screen to Electronics. I’ll tell Dave, the department manager, to be looking for you,” Sam replies. I start walking, and the green dots animate on my smartphone’s AR display, leading me on a path through the store. As I continue my journey through the store, my smartphone screen is occasionally interacting in real-time with objects and promotions as I pass them in the aisles, reminiscent of the movies Total Recall or Minority Report. Maybe it’s Phil Mickelson telling me the Callaway golf clubs on sale could improve my game, or Richard Petty suggesting that it’s time for an oil change on my car. Dave, the Electronics manager, greets me by my first name as I arrive in front of the selection of headphones. Populating my screen are a ranking of the most popular models and their customer reviews. Dave is a nice guy, but I am more comfortable with information on my smartphone and the crowdsourced wisdom. I am excited to hold the product in my hand, knowing that I will leave the store with it in my possession. I watch a couple of 2-minute unboxing reviews, make a choice, and scan the barcode on my phone. The 10% off coupon is automatically applied. I instantly checkout with my smartphone using Apple Pay, or just showing my credit card to the augmented reality (AR) app. And then I just walk right out of the store. What I have just described is the physical embodiment of online shopping and it is entirely achievable with existing technology…with just one small leap. Today, retailers are deploying a vast array of technologies to understand buying behavior both in terms of big-data analytics (what you buy) and in-store tracking (how you buy). Those cameras that you see aren’t looking just for shoplifting anymore, they are watching and analyzing YOU. They observe where you go and how long you interact with certain products. Artificial intelligence and the Internet of Things are making big strides in providing that understanding. The problem is that the numerous stores (the physical world) are often hundreds of miles away from the data centers and public clouds, too far away to allow for the real-time interaction described above. Edge Cloud is a rapidly growing industry trend to put the cloud infrastructure (compute, storage, and networking) close to where it’s needed. 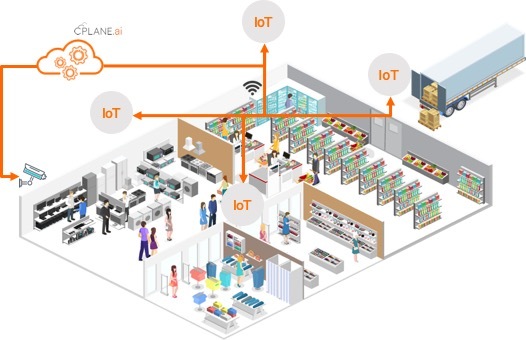 Of course it has to be easy to manage (think of having to manage 4,177 clouds in 4,177 Walmart stores); powerful and flexible enough to run a whole ecosystem of in-store applications, both now and in the future; host enough data for a rich and real-time AR and customer experiences; be super secure, not exposing the whole enterprise to even more security vulnerabilities; and integrate with big data analytics in faraway data centers, when there is time enough to load a local digital twin of a shopper or process. Sometimes it takes a leap. The future of retail, industrial processes, and smart cities among many other trends critically depend on Edge Clouds for nearby computing power and strategically-placed data. Edge Clouds are quickly rising as the ecosystem of innovation and growth for the decade to come. For detailed information about the differences between Edge and Fog Computing, download our latest white paper, titled, Demisitfying the Edge.